It would also end the jurisdiction of the European Court of Justice. But Labour warned it was being done without proper Parliamentary scrutiny. It comes a day after Prime Minister Theresa May triggered Article 50, starting the process which will officially take Britain out of the EU in March 2019. In a statement to MPs, David Davis said the repeal bill would allow businesses to continue operating on the day after the UK leaves the EU "knowing the rules have not changed overnight". It would also make trade talks easier because member states "will know that we start from a position where we have the same standards and rules", added Mr Davis. It would mean that workers' rights, environmental protection and consumer rights currently enshrined in EU laws would continue as UK laws, he told MPs - although Parliament would be free to change them later. The repeal bill will also "end the supremacy" of EU law in the UK, "delivering" on the result of last year's referendum, he added. "Our laws will then be made in London, Edinburgh, Cardiff and Belfast and interpreted not by judges in Luxembourg but by judges across the United Kingdom," he told MPs. Mr Davis said the repeal bill would not give the European Court of Justice a "future role" in the interpretation of UK laws, and UK courts will not be obliged to consider cases decided by the ECJ after Brexit. 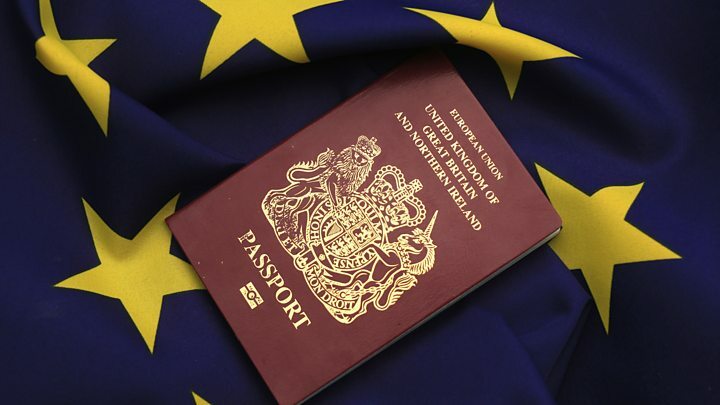 But UK courts will be allowed to refer to ECJ case law "as it exists on the day we leave the EU" and it would have the same status as Supreme Court decisions, which can be overturned by subsequent rulings. Reality Check: Does the Great Repeal Bill repeal EU laws? Business group the CBI welcomed the "clarity and continuity" of the repeal bill and said it would speak to ministers after Brexit about cutting EU red tape. For unions, the TUC called for guarantees that workers' rights such as full holiday pay and equal pay for women will be protected. There are more than 12,000 EU regulations in force in the UK, with the intention being that they are all going to be transferred into UK law. But the government says many of them will not work properly after Brexit without "technical changes", and allowing MPs to scrutinise these changes fully would create a "prohibitively large" amount of work for Parliament. It estimates that around 800 to 1,000 existing measures will need to change and proposes using statutory instruments - laws passed without much debate or scrutiny - to do so. Labour's shadow Brexit Secretary Sir Kier Starmer warned ministers were being handed "sweeping powers" to make hasty, ill thought-out legislation. But Mr Davis said any laws changed in this way would be time limited and any problems "we have missed will be put right". Lib Dem chief whip Tom Brake said: "If needed, we will grind the government's agenda to a standstill, unless proper and rigorous safeguards are given over the Great Repeal Bill. The ball is now in the prime minister's court." The SNP's Europe spokesman Stephen Gethins said: "It strikes me that the government has pushed the big red button marked Brexit with their fingers crossed and very little idea of what comes next." Media captionMEP Manfred Weber asks 'what are we doing' to European citizens? The government's white paper is entitled The Great Repeal Bill but it will be given a less dramatic name when it comes before Parliament because UK legislation must be described in a factual manner and anything that sounds like a slogan is banned. 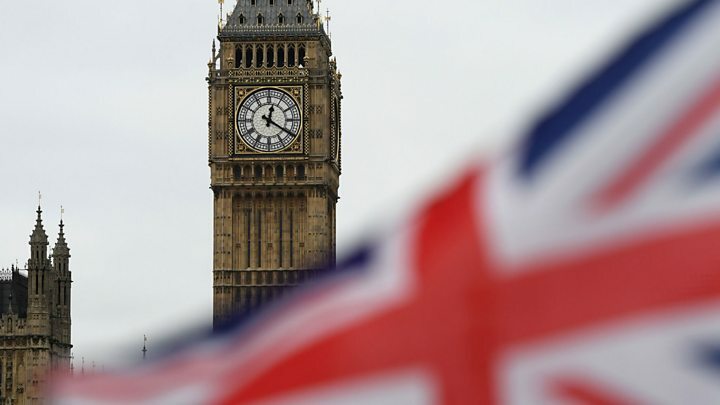 The government plans to introduce separate bills on some aspects of Brexit, such as immigration and customs rules at the border, which will be debated in Parliament. 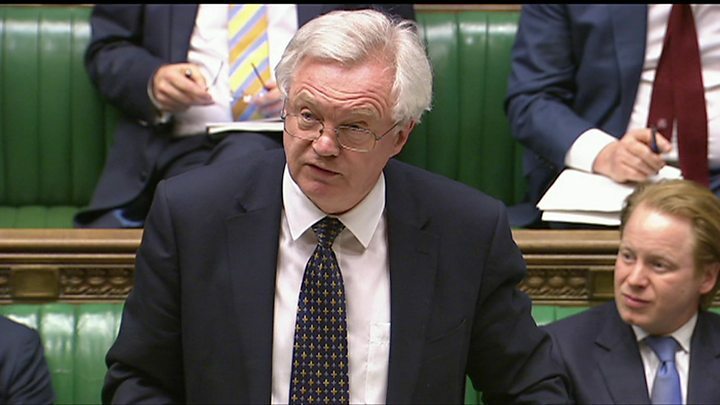 Mr Davis earlier hit back at claims the UK was trying to "blackmail" the EU by raising security issues ahead of Brexit talks. In her letter on Wednesday triggering Article 50 of the Lisbon Treaty, Theresa May suggested cooperation with the EU on the fight against crime and terror was at risk if Britain did not agree an overall Brexit deal within the two year time limit. The prime minister's words sparked an angry reaction from some EU officials who said security was too important to be used as a bargaining chip in trade negotiations. But Mr Davis told BBC Radio 4's Today programme "this is not a threat... it is a statement of the fact that this will be harmful for both of us... if we don't get a deal. It's an argument for having a deal". Mr Davis, who will be Britain's chief negotiator in Brussels, said the rights of British expats would be the first priority in Brexit talks. The UK also wanted "to deal with the Northern Ireland border situation early as well", he added. The EU wants to sort out an exit deal - including how much the UK might have to pay to cover its "existing obligations" - before turning to a future trade arrangement but Mr Davis said Britain wanted to "look at the whole package together". The prime minister has vowed to "consult fully on which powers should reside in Westminster and which should be devolved to Scotland, Wales and Northern Ireland". She has said that the process will lead to a "significant increase in the decision-making power of each devolved administration". The Scottish Parliament will get its own vote on the repeal bill and the UK government is working on the basis that it will need the consent of MSPs to get it through.